It’s cold and refreshing, gluten-free, vegan, delicious and looks fabulous! It will amaze and delight all who witness you cutting the first juicy slice to the very last juicy piece. This frosted illusion of a “cake” is actually made from a large seedless watermelon, 2 cans of coconut milk and sliced, colorful fruit and slivered almonds for decoration! The fun in making this perfect summer dessert is only rivaled by the look on your guests faces when they realize what it is! My daughter and niece and I made this incredible dessert together, laughed like crazy, and dazzled our guests and ourselves! 1) Extremely important: place 2 cans of full fat coconut milk in the coolest part of refrigerator overnight or for at least 10 hours. This will allow the coconut milk to separate– liquid milk on the bottom and the thick cream on the top. It is the cream that we will use to make the whipped cream. OR if you’re using the cans of Trader Joe’s Coconut Cream, there won’t be much separating but it’s best chilled for several hours. 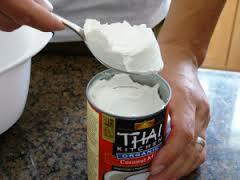 4) Scoop or scrape out the hardened coconut cream and put it into the cold bowl that you chilled in the freezer. Repeat same method with the 2nd can of coconut milk. 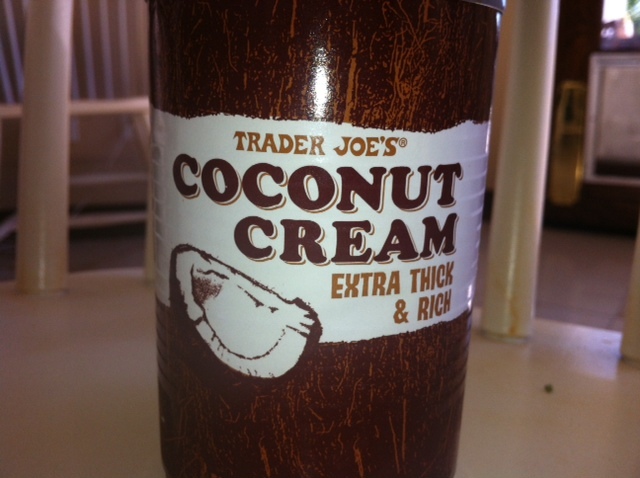 Same goes for the Coconut Cream. 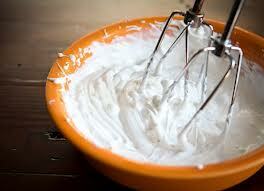 5) Start whipping the cream with the electric blender, adding the agave syrup and vanilla extract. It should become very thick. Once whipped into a beautiful frosting, place in the refrigerator for cold storage. 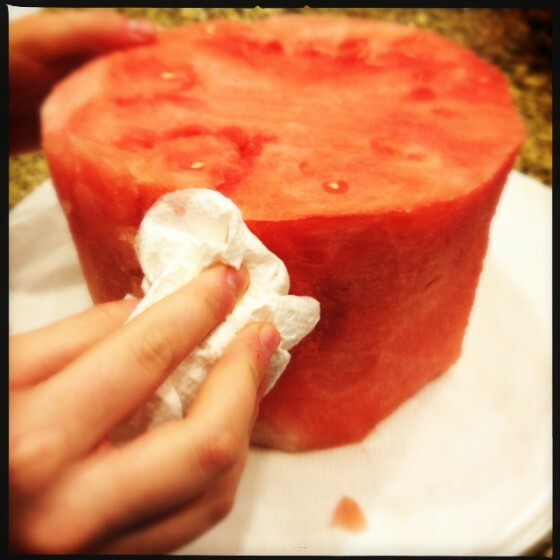 6) Carve the watermelon-–lay the watermelon on it’s side and cut off the top and the bottom. You should be left with a circular, cake-shaped piece. Try your best to level the top and bottom as evenly as possible. Place the piece upright so the rind is vertical. 8) Handle it gingerly and place it on the serving plate. 9) With paper towels, dab and blot up as much liquid as possible, leaving the the side and top dry. 10) With a frosting knife, apply the whipped frosting all over the cake. 11) Sprinkle with slivered almonds or shredded coconut, if desired. 13) Serve immediately. 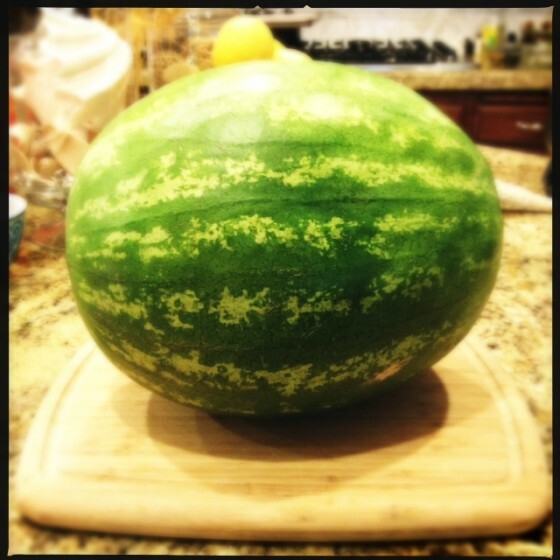 It may keep in the fridge for a couple of hours but that depends on how ripe the watermelon is. 1) Since making whipped cream from coconut milk always requires overnight chilling, keep a couple of cans in the fridge all the time for convenience. 2) The whipped cream can be flavored with maple syrup, chocolate, or other flavors. Experiment! This is sooo amazing!! I’ve never seen anything like it! How creative! OMG! This recipe is AWESOME!!!!!!! And I am a watermelon fanatic, so i would go crazy for this! This recipe is definitely a keeper! I have to admit–it really is a great one! When you make it, take a photo! 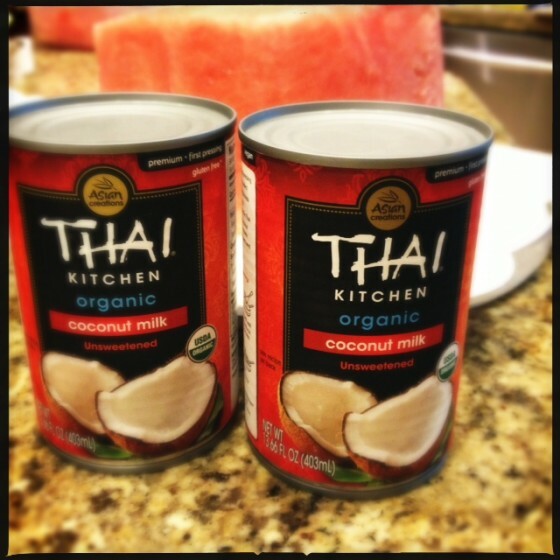 Put a few cans of coconut milk in the fridge NOW so it’s ready when you are! They totally had to eat their words… so it took three blondes… But boy did we have fun and it turned out to be a beautiful health-filled dessert. I loved every minute! Perfect for all my alimentary restrictions. So happy we got to make it!! 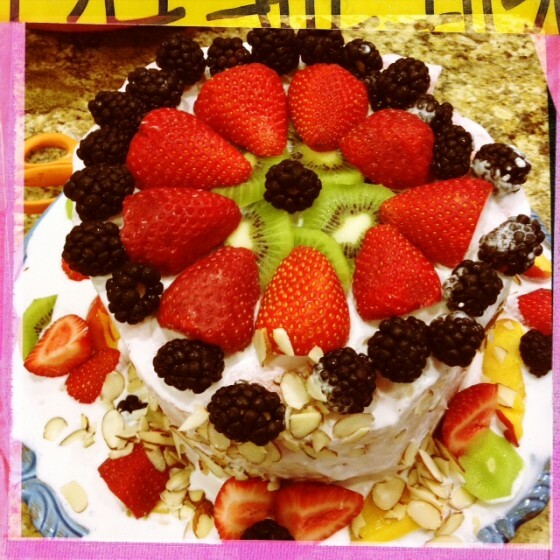 thanks a lot…..I am going to send this to a lot of my friends……thanks thanks thanks I love watermelon and I love cake…. Yes, now you can have your cake and eat it too. You can also impress your friends and family with this recipe! Another great one by Ellen Francis! This is awesome and it fits the GAPS Diet as well (gluten and dairy free). I’m making it next week. Enjoy, and thanks for your comment! What does GAPS stand for anyway? Hi Peggy! I’m excited for to make this—please let us know how it comes out. If I can make a suggestion—the coconut cream comes out a bit more thick and frosting-like than the separated coconut milk but I’m not sure how available it is around the country. If you’re near a Trader Joe’s I wold pick up a couple cans of the coconut cream and put in the fridge for when you’re ready to make this! It is a great one! Will try for a friend who’s a watermelon fanatic. Have you experimented with cutting it into two layers and using some frosting in the middle? Does it get too wet to do that well? I actually have experimented with making 2 layers. It works kind of if you’re serving it immediately. Also it depends how fragile the watermelon pieces are—as long as you’re careful when you lift the second layer on top, it should be okay. Blot it well with a paper towel—that should help too. If you’re going to store it in the fridge for the whole day, I think it will get too liquidy. 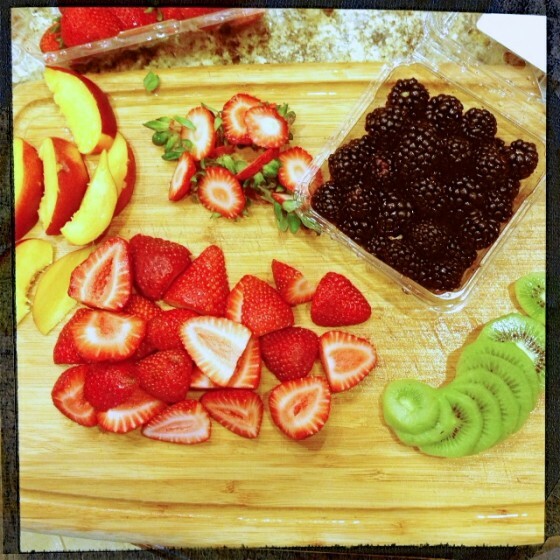 I was thinking of trying to do two layers but using fruit in between the layers—blueberries, strawberries, kiwis, etc. but not too many because we’d want it to stay stable. If you try that out, let me know how it comes out. Thanks so much for reading!! Ellen — the fruit idea sounds better — even slices… hmm — white peaches? Kiwi? Want color contrast. Maybe halved blackberries — blueberries would be too unstable. Thanks so much for the ideas and the reply. This original frosting (vs the lemon with conf. sugar) also looks like a winner for other applications. Would be cool except you stole the recipe from paleocupboard.com. I will be notifying the original author of this post. In the post where I include “Notes,” right before most of the photos, I thank both Paleocupboard.com and OhSheGlows.com for their inspiration. 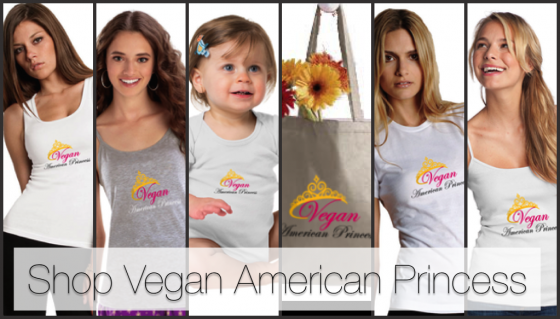 I “veganized” the original recipe so that no animal-derived products were used. 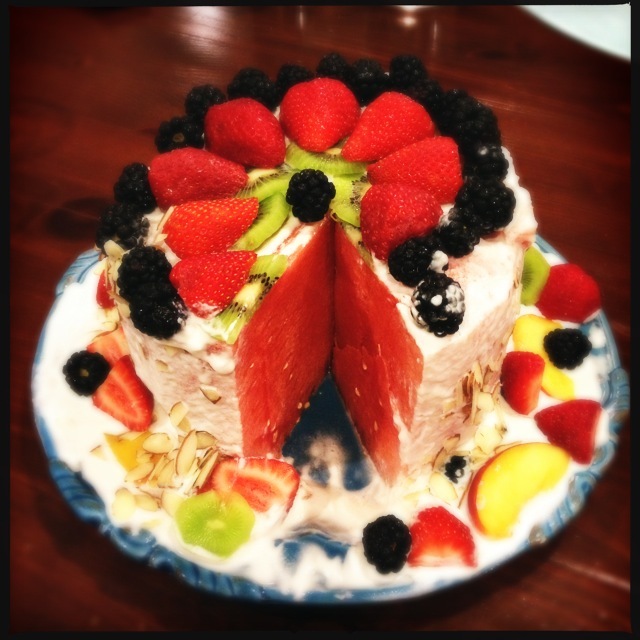 There are many variations of the watermelon cake floating around the web and I don’t know if paleocupboard.com “invented” it but I thanked them just the same. Thanks for reading! Awesome job!!! Would love to try this. I love watermelon and I love cake. Healthy option. 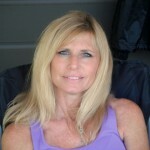 Hi Jane! We’d love to hear about it when u make this beautiful cake! It really is fun to serve! 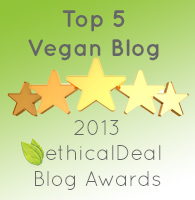 Thanks for reading–we love getting comments like yours! Am wanting to make this for a family BBQ. If I made it just before leaving, do you think it would hold for a few hours? Hi Valerie! Yes, it will hold fine for a few hours! Enjoy! I forgot to mention to keep it in the fridge!